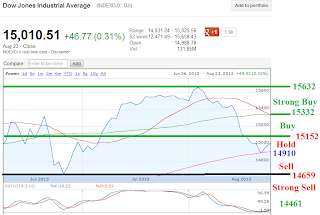 Stock market is expected to open flat higher tomorrow. This week lot of key economic data such as GDP, durable goods, personal income will be out. The talk of tapering will continue but its not going to end because the economic data are frozen. Last week 12.5 B was the biggest outflow of fund in 5 year as the concern of Fed tapering continues. DUST, NUGT will be hot stock to watch as long as the talk of tapering continues. I'll be watching long ANF, MRVL, LINE, CREE, ARUN, and short TSLA. Volatility stock like UVXY, VXX, and XIV should be played on daily basis. 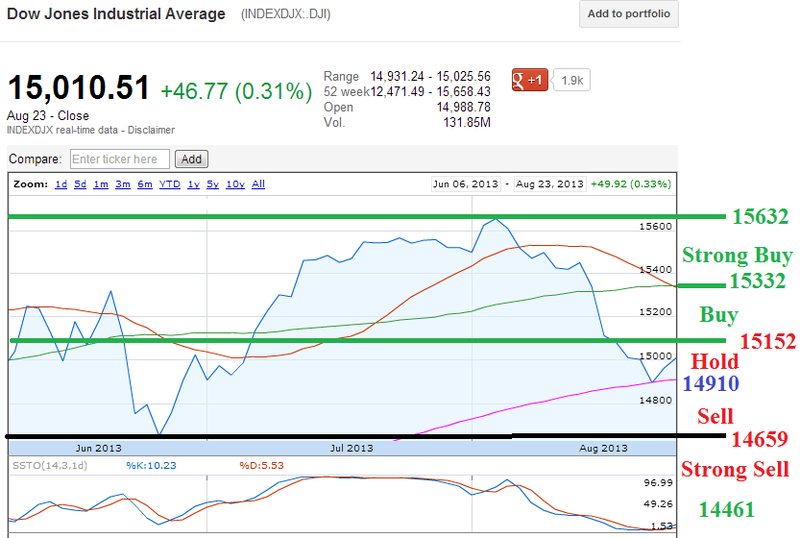 Trading Plan for Dow Jones Industrial Average. Current status (Buy with tight stop loss). Notable earnings report this week.